awards through this bonus program. KBF BONUS BUCKS is Kayak Bass Fishing’s incentive rewards program for KBF Members only. It promotes competitive kayak fishing by awarding bonuses to program participants fishing in select KBF competitions across the country. These bonuses are in addition to regular prize payouts and are funded through both KBF Sponsor funding and KBF BONUS BUCKS Program Enrollment Fees. To be eligible to win bonuses, one must (a.) become a KBF Member and (b.) enroll in KBF BONUS BUCKS. KBF Membership is required to participate in the 2019 KBF BONUS BUCKS Contingency Awards program. In order to be eligible for bonuses in any competitive event, Competitors must enroll in KBF BONUS BUCKS by midnight Central Time on the evening before start-of-competition. 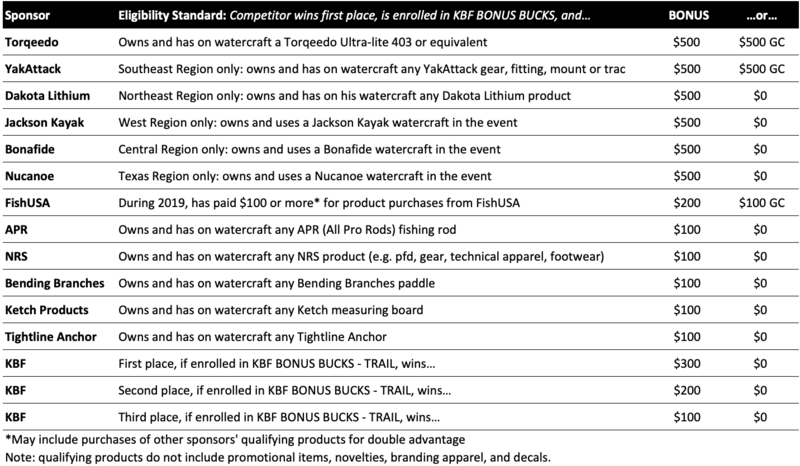 For the 2019 KBF National Championship, KBF BONUS BUCKS and KBF Big Bass Brawl have been combined. Together they infuse up to $53,100 in bonuses and prize money to this year’s KBFNC. To qualify for any bonus, one must enroll in KBF BONUS BUCKS – KBFNC no later than 11:59 PM CST on Wednesday, March 27. Assuming they are enrolled in KBF BONUS BUCKS – KBFNC by Wednesday, March 29, all Competitors are eligible to win bonuses. Sponsors’ BONUS BUCKS will be awarded by rank for ownership and use of Sponsors products. In most cases those bonuses roll down, although often at a lower bonus level, and go to the highest-ranked Competitors who meet each sponsor’s eligibility requirements by end-of-day Wednesday, March 27 (that’s midnight CDT after the Captains Meeting). Eligibility requirements are provided below. In other words, purchases of sponsors’ products must be complete before the first day of competition in order to be a qualifying purchase for the KBFNC sponsor bonuses. Torqeedo: If the 2019 Champion owns and has a Torqeedo Ultra-lite 403 or equivalent mounted on the watercraft he used in the KBFNC, Torqeedo will award him $5,000. If he does NOT meet that eligibility requirement, then the presenter will ask 2nd place, then 3rd, and on down until we find the top-ranked competitor who does, and a $2,500 check will be presented to that person. Bonafide: If first place is won by a competitor fishing from the Bonafide he owns, that’s worth $5,000. If not, then $2,500 will be presented to the highest-ranking competitor who owns and competed in a Bonafide. Nucanoe: If first place is won by a competitor fishing from the Nucanoe watercraft he owns, that’s worth $5,000. No awards down the line if first place isn’t in a Nucanoe. Jackson Kayak: If first place is won by a competitor who owns and competed in a watercraft by Jackson Kayak, he gets a $5,000l from Jackson. If not, then the MC will ask down the ranks, stopping at the first one who answers affirmatively and awarding a $2,500 to that competitor. YakAttack will award $5,00 to the 2019 Champion if he owns and has YakAttack products* (GearTrac, mounts, Leverage Landing Net, etc.) on the kayak used in KBFNC competition. If the Champ strikes out there, then $2,500 will be awarded to the highest-ranking competitor who does. NRS: If the highest-ranking Chinook PFD owner/user finishes in first place, NRS will award him a $5,000 bonus. If not, then we work our way down the ranks and the top Chinook-owner/user will receive a bonus check for $2,500. Tourney Tag: If first place is won by a competitor with his Tourney Tag in the photos he submitted, he wins a $500 bonus. If not, then that $500 will be presented to the highest-ranking competitor who owns and had Tourney Tags in his photos. KBF will award $5,000 to the first place finisher if enrolled in KBF BONUS BUCKS – KBFNC by the 11:59 PM deadline on Wednesday, March 27. If first place is NOT in KBF BONUS BUCKS, then the top competitor who is wins $2,500. FishUSA: During 2019, paying $100 or more for products purchased from FishUSA will be worth $5,000 to first place. If that competitor doesn’t qualify, then a $2,500 FishUSA Gift Card will be awarded to the highest-ranked competitor who does. Bending Branches: A competitor finishing in the top three wins a bonus if he owns and has on watercraft during the KBFNC any Bending Branches Angler Series paddle. $1,000 to first, $500 to second, and $250 to third place. APR: A competitor who wins the KBFNC and who owns and has on watercraft during competition any APR (All Pro Rods) fishing rod receives a $1,000 bonus. Second and third place bonuses to eligible competitors will be $500 and $250. LEW’s: Regardless of where one ranks, “You can’t lose with Lew’s!” But if you finish at the very top and you own and used any Lew’s fishing reel in competition, you’ll win a $1,000 Lew’s Reels bonus. Second place, if eligible, wins a $500 bonus, and third, $250. *Products do not include promotional items, like caps, decals, garments (except high-tech apparel from NRS) or other items that do not represent the company’s primary goods. Hourly $100 big bass prizes all three days of the KBF National Championship are worth $100 (doubled during the “Golden Hour,” first hour of each day). The prize goes to the Brawl participant with the biggest (highest-scored) bass of an hour. That’s $2,700 up for grabs in hourly increments on Days 1 and 2. On Day 3, the top two each hour win the hourly prizes. The daily big bass winners on Day 1 get $1,000 each, and on Day 3 the top three receive money: $3,000 for First, $2,000 for Second, and $1,000 for Third biggest bass of Day 3. Another $4,000 will be awarded for the biggest bass of the entire 3-day Championship period. By “biggest bass,” we mean the highest-scoring photo. A 25.25″ bass penalized 1″ for open mouth will be scored 24.25″ and may be beat out in the Brawl by a 24.50″ bass with no deductions. Ties are broken based on upload time stamps. All totaled, that comes up to $15,600 in prize money paid out for the KBFNC Big Bass Brawl. KBF is putting up $1,500 for the biggest bass (highest-scored photo) caught in the Red River and submitted to the Big Bass Brawl over the three days of KBFNC competition. $1,000 will be awarded to a second Brawler for the next biggest Red River bass of the event. 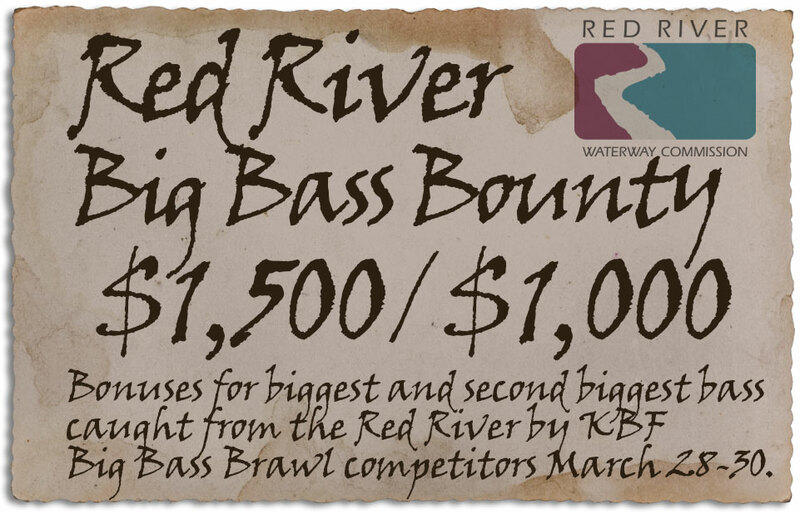 To be eligible, register for KBF BONUS BUCKS-KBFNC / KBFNC Big Bass Brawl and fish the Red River. Stop by the TourneyTag display at the KBFNC Expo (Red River Room, Harrah’s Louisiana Downs), pick up a few red stickers, and attach one to each of your three days’ Identifier Cards (or holder) to help judges identify fish caught from the Red River. Results will be verified by judges and event staff on Saturday afternoon before winners are announced. Ties will be broken by earliest upload time stamp. No more than one Red River Bounty will be awarded per competitor, so if one person submits the two biggest bass of the event, the top bounty goes to him and the $1,000 bounty rolls down. 2019 KBF TRAIL Series Championship—A cash bonus will be paid on top of the First Place Prize at this year’s TRAIL Series Championship, provided the competitor who wins the Event is enrolled in the KBF BONUS BUCKS program by midnight on the day before start-of-competition. Other KBF BONUS BUCKS participants who place in the top ranks also earn bonuses, the amount and number of places depending on registrations.